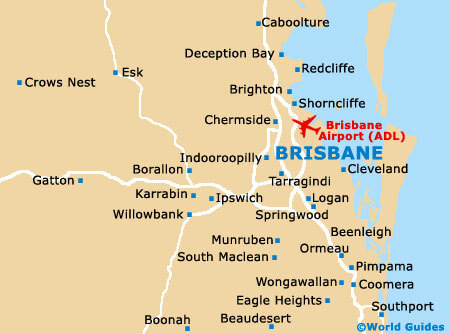 A popular city and tourist destination, Brisbane enjoys high visitor numbers due to its impressive concentration of Queensland attractions. When tourists first arrive in Brisbane, it is well worth joining one of the City High Lights Bus Tours and getting a feel for the layout of this large and diverse city. Top tourist attractions in Brisbane include the indigenous Australian wildlife within the Koala Bushlands, and the walking trails to be found at both the Kangaroo Point Cliffs and Mount Coot-tha. Also of note is the glitzy Conrad Treasury Casino, guided tours of the city's very own Coca Cola Factory, and the Mount Gravatt Lookout, where splendid views of the D'Aguilar Range and the Glasshouse Mountains can be expected. 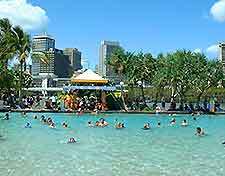 Walking tours of Brisbane are widely available and operated by numerous tour guides and companies. Providing a real insight into many of the city's premier tourist attractions and heritage buildings, such as the City Hall and Parliament House, guided walking tours are led by friendly, informal Australian guides who usually live locally and come with an enormous wealth of knowledge, happy to answer your questions. The tourist information centres always have the latest information about guided tours of the city. Operated by the Brisbane City Council, the City High Lights Bus Tour is one of the best guided bus tours of the city. Featuring knowledgeable and informal commentary, the City High Lights Bus Tour stops at around 20 major locations on route. The bus tours are also a very convenient way to travel around, since the bus ticket is valid all day, allowing you to get off and rejoin the bus tour later, with many regular buses stopping each hour. Brisbane's location in Queensland, close to major cities, towns, islands, beaches and coastlines, has meant that countless tour operators have evolved. Offering a vast and diverse mixture of guided cruises, tours and excursions, some of the city's most popular tours include coach trips to the Sunshine Coast, the Gold Coast, rainforest areas and dolphin-watching cruises around Moreton Bay. The latest detailed information about current guided tours and cruises is available at the numerous tourist information centres, throughout the city. 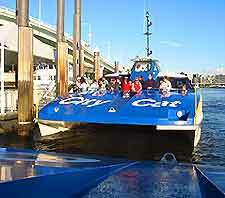 CityCat Cruises travel the entire length of the Brisbane River each day, making many stops along the way, and have become one of the premier cruises in the area. 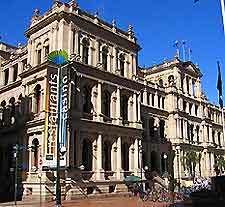 Conrad Treasury Casino, in the city centre, is one of Brisbane's most popular tourist attractions and can be found in the old Queensland Government Treasury building. Full of numerous roulette and blackjack tables, fruit machines and many other gaming options, the Conrad Treasury Casino also features live entertainment, wine bars and restaurants with exceptional views of the nearby riverfront. 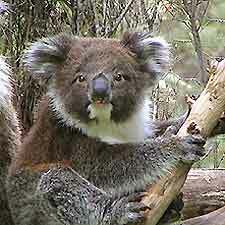 The Koala Bushlands can be found to the south of central Brisbane and are made up from several large areas of Eucalypt forest. Home to several thousand koalas, the Koala Bushlands is also rich in other native wildlife and local flora, and guided tours are often available. The state-of-the-art IMAX Theatre is located in the South Bank area and has become a major tourist attraction for visitors to Brisbane. With an enormous cinema screen displaying three-dimension movies, a visit to the IMAX Theatre is a memorable one. 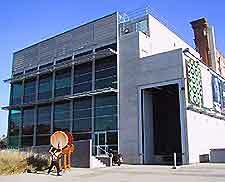 Situated in the Fortitude Valley region, the Brisbane Powerhouse is a popular centre of arts and theatre. The Powerhouse regularly hosts many of the city's most important events, festivals, concerts and theatrical performances. The fascinating Coca Cola Factory Tour takes place in the southern suburbs of Brisbane, in the large Coca Cola factory. Guided tours give visitors a real insight into how Coca Cola is made and there are some very interesting displays along the way. The Double Helix is a popular attraction which comes alive at night. Featuring regular concerts, dances, live entertainment and hosting major festivals, the Double Helix venue is located in the scenic Fortitude Valley area of the city. The Kangaroo Point Cliffs stand in the city's southern outskirts and are within easy driving distance of central Brisbane. Home to many nature trails, rock-climbing facilities and picnic areas, the Kangaroo Point Cliffs also feature spectacular views of both the surrounding countryside and the city centre itself. The glorious Mount Coot-tha area, in the city's nearby suburbs, features large areas of rainforest, walking trails, picnic spots and cafés. Of particular interest is the Mount Coot-tha Lookout, which has breathtaking panoramic views across all of central Brisbane. Rich in local wildlife and colourful, native birds, Mount Gravatt is a magnificent location, filled with walking trails and forested areas. With breathtaking views, picnic facilities, seating areas, fascinating remains of historic gold mines and botanical gardens, Mount Gravatt is a popular day out and is within easy reach of the city centre. 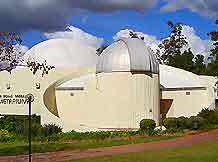 The Brisbane Planetarium is sited in the splendid Mount Coot-tha Botanical Gardens, on the outskirts of the city. Providing incredible views of the sky at night, other attractions at the Planetarium include large astronomical displays, historic equipment and many seasonal star-gazing events. Sunset Cinema is one of the most popular evening attractions in the city centre. Consisting of classic films projected outside in the peaceful surroundings of the City Botanical Gardens, the exciting open-air Sunset Cinema regularly attracts large crowds and is a very atmospheric way to watch some of your favourite films.